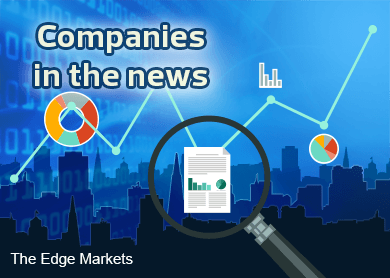 KUALA LUMPUR (April 20): Based on corporate announcements and news flow today, companies that may be in focus tomorrow (Tuesday, April 21) could be: Sunsuria Bhd, AEON Credit Service (M) Bhd, IGB Corp Bhd, Ecofirst Consolidated Bhd, Emas Kiara Industries Bhd, Top Glove Corp Bhd, Nexgram Holdings Bhd, Nestle Bhd, Axis Real Estate Investment Trust (Axis REIT), See Hup Consolidated Bhd, Jobstreet Corp Bhd, Suiwah Corp Bhd, Hovid Bhd and Bioalpha Holdings Bhd. Property developer Sunsuria Bhd has proposed to buy the remaining 50% stake it does not own in Sime Darby Sunsuria Development Sdn Bhd (SDSD), a joint-venture with Sime Darby (Sungai Kapar) Sdn Bhd, for RM173.4 million, cash. SDSD is a development company incorporated to undertake the Suria Serenia development on a 331.27 acres land located at Putrajaya South, which surrounds the upcoming Xiamen University Malaysia Campus. In a statement to Bursa Malaysia today, Sunsuria (fundamental: 2.5; valuation: 0.8) said it will have full control of SDSD, subsequent to the corporate exercise, which is expected to be completed by second quarter of 2015. AEON Credit Service (M) Bhd’s net profit jumped 15.8% to RM55.4 million in the fourth quarter ended Feb 20, 2015 (4QFY15), from RM47.8 million in the previous corresponding quarter. Revenue leapt 20.4% to RM226.37 million, from RM187.99 million previously. In a filing with Bursa Malaysia, AEON Credit attributed the improvements to growth in transaction, financing volume and auto financing operations. Cumulatively, AEON Credit’s FY15 net profit climbed 18.3% to RM207.4 million, from RM175.4 million in the previous year; while revenue surged 26.8% to RM852.8 million, from RM672.8 million previously. Going forward, AEON Credit expects to maintain its current performance in the financial year ending Feb 29, 2016, based on implementation of its business plan. Property developer IGB Corp Bhd has proposed to sell a small tract measuring 0.03 acre in Gombak, Selangor, for RM62.8 million to Ecofirst Consolidated Bhd (ECB), which is also involved in property development. In an announcement to Bursa, IGB (fundamental: 1.2; valuation: 2.2) said Harta Villa Sdn Bhd (HVSB) had today entered into an option agreement with EcoFirst Development Sdn Bhd (EDSB) — a wholly-owned unit of ECB (fundamental: 0.7; valuation: 0.5) — for the right to purchase the land. HVSB is a wholly-owned unit of Tan & Tan Developments Bhd, which in turn is a wholly-owned subsidiary of IGB. The proposed sale does not require the approval of IGB shareholders, but it is conditional upon the approval of ECB shareholders. IGB said the disposal of the land represented an ‘opportune time’ to realise a gain from its investment, given the significant appreciation in the value of the land since it was first acquired in 1994 at RM36 million. Assuming the approval from ECB shareholders is received, IGB is expected to register a gain on disposal after tax of RM17.7 million. Engineering solutions provider Emas Kiara Industries Bhd’s wholly-owned subsidiary Kiaratex Export Pte Ltd has been awarded a sub-contract work at Singapore’s Changi Airport for S$8.67 million (equivalent to RM23.25 million). In a filing, Emas Kiara (fundamental: 1.65; valuation:0.9) said Kiaratex has entered into a sub-contract agreement with Penta Ocean Consctruction-Civil Tech Joint Venture (POC-CT JV) for the installation of prefabricated Vertical Drain Works (PVD) and PVD surcharge trial panel works for Singapore's Changi Airport for the said sum, excluding goods and services tax (GST). POC-CT JV is the main contractor for the land preparation works for Changi Airport Development, appointed by the Ministry of Transport, Singapore. Glove manufacturing giant Top Glove Corp Bhd has offered to acquire a 1.5 acre plot of commercial land in Bukit Raja, Selangor, from Century Total Logistics Sdn Bhd, a wholly-owned subsidiary of Century Logistics Holdings Bhd, for RM20.26 million. In a filing with Bursa Malaysia, Top Glove (fundamental: 2.5; valuation: 1.3) said the deal was offered through its wholly-owned subsidiary, Top Glove Properties Sdn Bhd. Top Glove also said the sales and purchase agreement for the proposed acquisition is expected to be signed within 21 days from the date of signing acceptance by the vendor (April 17, 2015). Telecommunication software player Nexgram Holdings Bhd announced its wholly-owned subsidiary Nextnation Network Sdn Bhd had signed a share sale agreement with Power Solution Group Ltd to acquire 186,000 shares or 18.6% stake in Godynamic Investments Ltd for RM18.53 million cash. The acquisition will increase Nextnation’s stake in Godynamic to 69.6%, from 51% currently. In a filing with Bursa Malaysia this evening, Nexgram (fundamental: 2.1; valuation: 1.7) said the acquisition of the stake was based on the future prospects and potential earnings of Godynamic, stemming from the service agreement that its 84%-owned subsidiary PT Flower Star Media had signed with Small Guard Inc on March 20, 2015. Nexgram, which is controlled by its managing director and chief executive officer Datuk Tey Por Yee who has a 20.13% equity stake, expects to complete the share acquisition in the first quarter of the financial year ending April 30, 2016 (FY16). Nestle Bhd’s net profit grew 2.4% to RM187.9 million in the first quarter ended Mar 31, 2015 (1QFY15), from RM183.5 million in the previous corresponding quarter. Quarterly revenue was nearly flat at RM1.28 billion, up 0.4% from RM1.27 billion previously. Nestle (fundamental: 1.35; valuation: 1.5) told Bursa Malaysia that the improvements were mainly driven by its consumer promotional campaign. The group also admitted lower export sales to affiliated companies had an “impact” on its overall turnover development. However, against the fourth quarter of last year, the impact was much smaller, indicating a sign of stabilisation. Nestle expects 2015 to be a very challenging year, due to the implementation of the goods & services tax. Axis Real Estate Investment Trust (Axis REIT) has announced its first interim income distribution of 4.10 sen per unit, or a total of RM22.5 million, for the first quarter ended March 31, 2015 (1QFY15). In a filing to Bursa Malaysia today, Axis REIT announced it had posted a 4% increase in its net profit for 1QFY15 to RM23.3 million, from RM22.4 million a year ago. Revenue meanwhile grew 14% to RM40.6 million, from RM35.6 million previously. On prospects, Axis REIT (fundamental: 0.9; valuation: 0) said it was optimistic that it would be able to maintain its current performance for FY15. Cargo transportation and freight forwarding service provider See Hup Consolidated Bhd’s wholly-owned unit See Hup Transport Sdn Bhd has entered into a conditional sale and purchase agreement with Loh Gim Ean Holdings Sdn Bhd (LGE) for the proposed disposal of three adjoining lots of development land in Seberang Prai, Penang, for RM17.6 million cash. The three plots of freehold land measure a total of 146,143 sq ft.
See Hup (fundamental: 0.75; valuation: 0.9) told Bursa Malaysia that while the land is currently being used as its lorry depot and truck servicing area, it will move these operation to a new area after the disposal. See Hup's share price closed unchanged at RM1.10 today, for a market capitalisation of RM56.25 million. Pioneer local employment portal company Jobstreet Corp Bhd is in no rush to acquire a new core business, chief executive officer Mark Chang said after the group’s extraordinary general meeting. Chang said Jobstreet (fundamental: 1.95; valuation: 2.4) is open to investing in any business sector, but particularly favours new companies, though he did not rule out the possibility of starting up a new job portal. However, he noted the group is adopting a conservative approach and will focus on spending the next two years studying the market, before it decides its future direction. After completing the disposal of its online job portal to Seek Asia Investments Pte Ltd for RM1.89 billion on Nov 20 last year, JobStreet had distributed almost all proceeds of the disposal as a special cash dividend to shareholders at RM2.65 per share. Penang-based Qdos Holdings Bhd, a wholly-owned subsidiary of Suiwah Corp Bhd, is investing up to RM35 million to introduce new cutting-edge technology in the local semiconductor industry. Suiwah is an operator for malls and convenience stores in Penang, through the ‘Sunshine’ and ‘Suiwah’ brand. In a statement today, Qdos business development director S. Suresh said to-date, the company had invested RM25 million in equipment, manpower and technology transfer activities to develop the new technology in the country. Moving forward, he said there will be another RM10 million investment in this year alone, to manufacture Molded Interconnect Substrates (MIS) circuits. Suresh said the MIS technology enables the production of super fine circuitry that can advance high performance applications — particularly equipment with 4G, low noise and high frequency requirements. Generic pharmaceutical products maker Hovid Bhd saw Kumpulan Wang Persaraan (KWAP) emerged as its substantial shareholder, after a procurement of five million shares from the open market on April 8. In a filing with the local exchange, Hovid (fundamental: 2.1; valuation: 0.5) said the retirement fund had 38.5 million shares or 5.042% stake in it as at April 8. On April 9, KWAP acquired a further two million shares, increasing its stake in Hovid to 5.3% or 40.5 million shares. Bioalpha Holdings Bhd, which debuted on the ACE Market of Bursa Malaysia last Tuesday (April 14) but saw its share price jump as much as 135% since then, told Bursa today that it was not aware of any unannounced corporate development that may account for the recent price hike in its shares. In a filing to the bourse today, it also said it is not aware of any rumour or report concerning its business or affairs — or that of its subsidiaries — that may account for the unsual market activity (UMA). The explanation from the government-controlled health supplement manufacturer came after an UMA query was issued by Bursa earlier in the day, following the recent spike in is share price and volume. The Ministry of Finance Inc owns a controlling 51.4% indirect stake in Bioalpha. Bioalpha’s shares rose as much as 8.5 sen or 22% to 47 sen today. This is a 27 sen or 135% jump from its initial public offering (IPO) share price of 20 sen each. It was last done at 41.5 sen today, after some 193.83 million shares were traded, which gave it a market capitalisation of RM192.3 million.